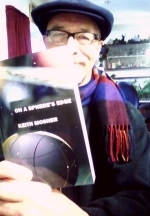 This entry was posted in Curmudgeon Code, Journal, On a Sphere's Edge and tagged Book, Sphere's Edge, Writing. Bookmark the permalink. It was nice to meet you and I enjoyed the event. Thanks for the conversation. Rick, you are welcome, and thank you.